Codemotion Amsterdam Webinar: You Too Can Be A Sketching Machine! I’m excited to announce that I will be presenting my talk You Too Can Be A Sketching Machine for the next Codemotion Amsterdam webinar. 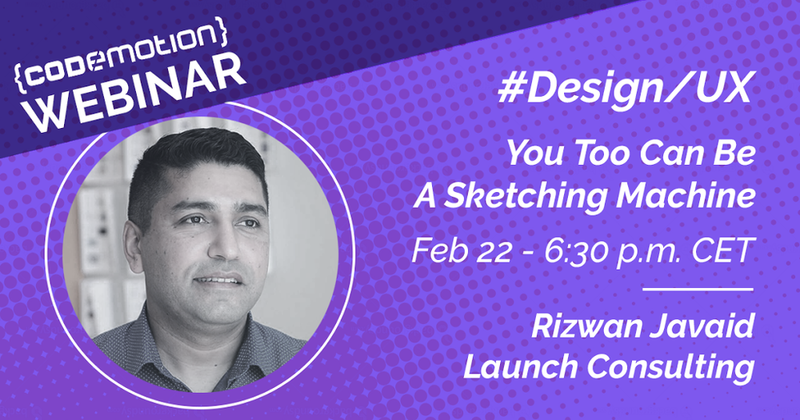 Come learn why sketching is important for developers and have fun sketching. Happy Friday everyone! I hope you had a challenging week. In a good way of course. This is a reminder to seek out and jump on opportunities to expand your comfort zone. I have been selected to present my talk You Too Can Be A Sketching Machine! as a webinar. This is my next big challenge. It is a challenge to present in front of a live audience and even more challenging when there is nobody in front of in person. During a webinar presentation, you can't count on things such as eye contact, body language, or instant feedback on your ideas, but this is a new experience which will help me grow and improve my presentation skills. Your Turn: Over the weekend, think of experiences you would like to have to help you expand your comfort zone. Practice sketching on a daily basis to gain the confidence you need to sketch on the spot without any hesitation. By learning and understanding the importance of sketching in the design process you will be able to develop a sketching mindset. With a sketching mindset, you will have a powerful tool at your disposal and use to ideate, explore, and share your ideas. Remember me? I know, it’s been a long time since we have talked. I want to share with you today why I have been absent for too long. Life came at me hard. I thought I was going to get right back up, but this time the blow was intense. It got me off my rhythm. Before this happened, I was in a rhythm of writing articles, sending out my weekly newsletter, presenting at conferences, and having a blast doing it all. If you have done Spec work then you know what I’m talking about. The countless hours you put into creating something in hopes of being rewarded. You think to yourself, this time I’m going to win. This time they will realize how brilliant my designs are. This time it’s going to be different. But it isn’t different. You’re not recognized for your brilliance. This time you lose again.